Healthy skin care involves many different elements. However, the basis of obtaining and maintaing healthy skin is to ensure basic skin care needs are followed. Listed below are links to the basics, when it comes to skin care. These basics are: dealing with dry skin, oily skin, skin that is very sensitive to products and the environment, and skin that is aging poorly. In addition, face and lip skin care as well as men's skin care are discussed. Dry skin is a significant problem in the skin care world, especially for people in dry and cold winter climates. 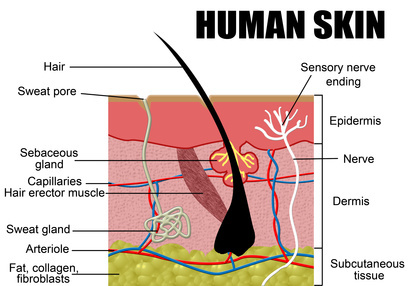 The dry skin care page provides information on dry skin causes, dry skin symptoms, dry skin prevention recommendations, and also discusses the various dry skin treatments to restore skin to a normal moisture balance. The complete opposite of the dry skin problem is the oily skin problem. Oily skin attracts dirt and can lead to skin blemishes such as pimples and acne. A variety of oily skin care information is provided at the oily skin care page to effectively deal with this skin care problem. With the growing number of pollutants and contaminants in our environment, food, and water, a particular side-effect has emerged and that is more people with sensitive skin. Therefore, healthy-skincare.com has a whole section on how to deal effectively with sensitive skin. Aging skin care is a concern for all individuals. How to prevent or reverse the signs of aging is an area that is receiving significant attention these days in light of the vast number of baby boomers who are getting older. At the anti-aging skin care page, you will find information on skin aging causes, symptoms of skin aging, skin aging prevention tips, and a wide variety of surgical and non-surgical skin aging treatments. This type of information is invaluable if you want your skin to remain youthful looking for as long as possible. The skin on the face is the most visible part of the body and is the area the makes the greatest impression on other people. It is important to ensure that proper healthy skin care is followed for the facial region. The face skin care page provides the necessary information to achieve healthy skin for the face. Once a topic that was ignored and never talked about in the past was men's skin care. However, is very important nowadays. Visit the link above for a variety of information on healthy skin care for men. The lips are composed of skin and often proper skin care for the lips is ignored. Lips can become chapped or suffer from a variety of skin care problems such as angular cheilitis, cold sores, or canker sores. The lip skin care page provides information for proper care of the lips and care of lip related problems. More information available at Healthy Skin Care.